The training and extensive daily experience of our interventionalists and neuroradiologists has enabled them to develop subspecialties within their field to better serve the specific needs of our referring physicians. 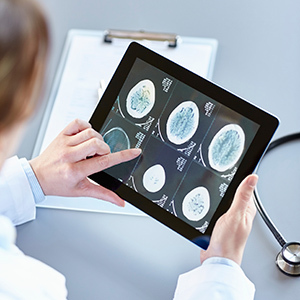 Diagnostic subspecialty areas of expertise include cerebrovascular disease, spine imaging and pediatric neuroradiology. Interventional radiologists are board-certified physicians who specialize in minimally invasive, targeted treatments. They offer the most in-depth knowledge of the least invasive treatments available coupled with diagnostic and clinical experience across all specialties. They use fluoroscopy, MRI, CT and other imaging to advance a catheter in the body, usually in an artery, to treat at the source of the disease non-surgically. As the inventors of angioplasty and the catheter-delivered stent, which were first used in the legs to treat peripheral arterial disease, interventional radiologists established minimally invasive modern medicine. Interventional radiologists' unique blend of skills promotes innovation and enables them to adapt their imaging expertise to pioneer non-surgical treatments that are guided by imaging. When it comes to the best practices for safely performing minimally invasive treatments, interventional radiologists established the procedures and the standards for safety and quality. Patient safety is incorporated into the development of these advances because interventional radiology and diagnostic radiology training programs include radiation safety, radiation physics, the biological effects of radiation and injury prevention. Interventional radiology is a recognized medical specialty by the American Board of Medical Specialties. Interventional radiologists are board-certified physicians with additional advanced training in minimally invasive, focused treatments performed using imaging to guide them. Their board certification includes both Vascular and Interventional Radiology and Diagnostic Radiology which are administered by the American Board of Radiology. Interventional procedures may involve multiple imaging technologies such as ultrasound, MRI, CT and fluoroscopic x-ray. Interventional procedures generally require referral from a physician. Patients are encouraged to bring any relevant prior films or records with them or the date and location of other information, which might be obtained. It is helpful to compare previous imaging studies with new ones (if they are available).The interventional radiologist works closely with the referring/treating physician. All procedural results are promptly communicated to the referring doctor. Neurointerventionalists are specialized physicians proficient in therapeutically treating diseases of the brain. As a level I Trauma Center, Hartford Hospital performs extensive interventional radiology procedures which include but are not limited to internal/external carotid artery embolizations, acute stroke, GDC coil occlusion of intracranial aneurysms, treatment of vasospasm and atherosclerotic occlusive disease and carotid artery stenting. For more information regarding the Acute Stroke Interventional Program, click here. As part of a multidisciplinary team approach in the treatment of cancer and cancer related disorders, the interventional oncologist uses image-guided techniques designed to diagnose and treat localized cancers in ways that are precisely targeted and minimally or non-invasive. For more information regarding Clinical Interventional Oncology, click here. The Vascular and Interventional Radiology Section offers advanced minimally invasive image guided diagnostic and therapeutic care for a wide variety of vascular and nonvascular conditions pertaining to the chest, abdomen and extremities. For a list of Specialized Procedures please click here. If conscious/IV sedation is required to complete the procedure, pre-procedure diet instructions vary by the patient's age. Our nurses will contact you prior to your procedure to review your medical information and to give you instructions for arrival and preparation. If you have questions you can contact Radiology Nursing at 860.972.3292. Let a technologist know if you have had previous contrast/reactions allergies. Patient should consult with their physician about when to stop Coumadin prior to procedure. Most interventional procedures require laboratory work and placement of an IV in a hand or arm prior to procedure for the administration of fluids and other medications (most frequently antibiotics and / or sedatives) during the procedure. The length of time involved in interventional procedures varies. Patients, who receive pain medication or sedation, should plan for a 6 to 8 hour hospital stay. Occasionally, patients are kept overnight. Such patients must arrange for transportation home. Sedation may be necessary in some circumstances to help a patient complete an imaging examination or interventional procedure. Sedation, administered by intravenous (IV) injection, is used to relieve patient discomfort, emotional tension and to achieve the patient's cooperation with the study or treatment. The type and level of IV sedation selected by the radiologist will vary depending on the patient's age and the type of exam or procedure being performed. Under sedation, patient consciousness is maintained. Patients retain the ability to breathe on their own and respond to instruction, but they may not remember the experience. Intravenous sedation is administered by a registered nurse under the direction and supervision of the radiologist. Interventional radiologists along with the radiology nurses will advise you of your discharge instruction based on your particular procedure.